The "Hedgehog Trinity" keyart, (courtesy of Sonic Retro) showing Silver's alternate pose. I really do not joke when I go on about the Depository having umpteen gigs worth of unseen stuff just waiting to go online. Seriously, we’ve discs and discs of the damn stuff that I acquired waaaaay back before I even dreamed of working for the big blue. A prime example of this treasure trove being yesterday when I got an enquiry about something from Woun, who you guys may know as a scener who has been responsible for a lot of recent discoveries, unlocks, site decompiles etc. In regards to the Sonic 06 Silver render from the other day he brought to my attention the OTHER Silver render from Sonic 06, Silver’s initial render which was in one of the keyart pieces used to promote the game at the time. 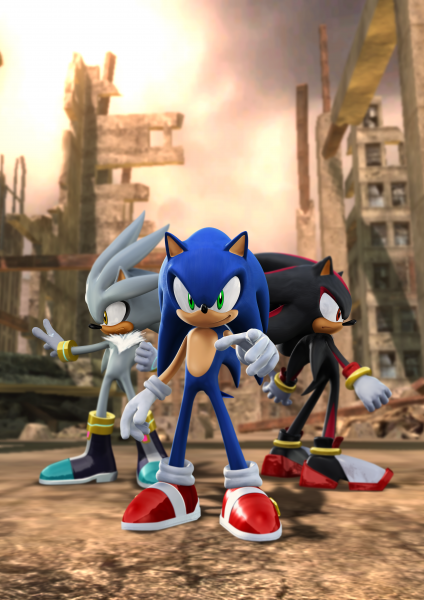 The “Hedgehog Trinity” one with Sonic in front of Silver and Shadow. Now I knew the Sonic render was out and about, and I could’ve sworn the Shadow one was as well… but Silver? I must admit I was a bit surprised there’d be interest in that so I had a look through some of the old discs (some are so delapadated I’ve subsequently transferred them onto hard drive and chucked them now) and I actually had some success! I found an old JPEG file of it which I’ve subsequently turned into a PNG for you all. After this though curiosity got hold of me and I checked. I checked both the Sonic Official Art Archive and I checked Sonic Retro too – and to my surprise neither site has this, so unless someone else has it and both these resources have somehow missed it I’m gonna go out on a limb and say it looks like I’ve inadvertantly rediscovered a “lost” render. A render I’ve been sitting on for nigh on FIVE YEARS. You can find the render, which is a pretty decent size, in the Silver The Hedgehog page in the Official Art & Images section of the Depository. Consider it an ending to that mystery – perhaps you could call it an absolution? I don’t recall seeing the Shadow one standalone before but I’ll chalk that one up to my memory, lest somebody pulls the link to it out and goes OH HEY, THIS IS WHERE IT IS. …I would appreciate that though. Woun asked about Shadow… not sure about him. Since then Shadow would not be? Sure thing Aquaslash, fine by me. I like this render MUCH better than the official one. Maybe it’s the stronger silhouette… or maybe it’s the fact that the pose hasn’t shifted his leg away from the outline of his hip in a way that makes it look like he’s got a pot belly. Silver’s meant to be a scrawny little kid, dammit!